This Precor EFX 885 elliptical review incorporates feedback from hundreds of customers across the country. It’s not just based on our opinion, but the honest reviews of real people who own the product and have used it for a substantial amount of time. This means they can give you insights into what it’s really like to have this machine in your home or facility – not just what it’s like out of the box. So, what do customers appreciate about the Elliptical Fitness Crosstrainer (EFX short) and who is it suitable for? In this Precor EFX 885 elliptical review, we evaluate all of the key features, so you can decide if it’s right for you. Customers consistently comment on the smoothness of Precor ellipticals. They were the original inventors of the elliptical category over 20 years ago and have refined the movement to what many describe as perfection. When customers get on an 885 elliptical, they often say that it’s ‘one of the smoothest ellipticals’ that they have tried and has a noticeably different motion to other machines. This super-smooth motion doesn’t just enhance the workout experience – it can improve your results too. The fluid movement means you feel like you’re putting less effort into the workout, so can push yourself harder for longer. This helps you to increase the intensity and duration of your sessions so that you get the results you want in even less time. 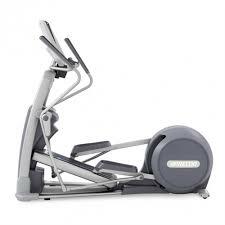 No Precor EFX 885 elliptical review would be complete without mentioning the patented CrossRamp feature. This is a key differentiator from other models and helps to create a customized elliptical motion for different types of user. The CrossRamp can be moved up or down, effectively adjusting the depth of your stride. Deeper movements challenge the glutes and quads, whereas shallower strides provide an all-around leg workout. The moving arms allow you to get a total body workout from just one machine. They enable you to burn more calories and get more from your precious gym time. The range of built-in workout programs also helps you to target different muscle groups and fitness goals, such as fat loss or intervals. Combining the CrossRamp with increased resistance can help you to get even better results from your machine. The Precor EFX 885 is a market-leading elliptical thanks to its smooth stride motion and patented CrossRamp feature. People often comment that they can feel the quality, which is something you’d expect from a premium manufacturer like Precor. Customers who’ve purchased describe it as ‘definitely the best elliptical on the market’ and often comment that they ‘prefer Precor over the other brands’. If you run a fitness facility, then be prepared for your members to be impressed. We’ve heard numerous stories of members lining up to use Precor 885 ellipticals, even when other machines are available. It has all of the best features of any elliptical on the market, along with durability and longevity thanks to the quality of its manufacture. The built-in touchscreen leverages swipe technology that’s similar to an iPad. It enables you to watch TV, browse the internet, or even connect your phone (depending on the model). People love to have these distractions during their workout as it makes time pass faster and reduces boredom. If you’re someone who doesn’t particularly enjoy long cardio sessions, then the touchscreen entertainment feature may be your new best friend. The EFX 885 is a state-of-the-art elliptical that delivers a top-class workout experience. Unlike other machines in this category, it features a unique CrossRamp that allows you to change up your routine and target different muscle groups. The smooth motion is a hallmark of the brand and can help you to work-out for longer, so you see results more quickly. If you like to be entertained during your workout sessions, then you’ll love the touchscreen TV and internet capabilities. This Precor EFX 885 elliptical review is intended to highlight the most frequent feedback we hear about this machine. If you’d like to learn more about the product, then check out its key features here. Alternatively, get in touch with one of our team and we’ll be happy to answer any questions you may have.